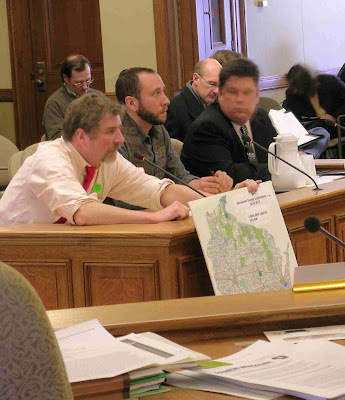 Michael Vickerman (left), Josh Stolzenburg (center), owner of North Wind Renewable Energy, LLC, Stevens Point, and Dave Miller, Wave Wind, LLC, Sun Prairie, testify in support of the Clean Energy Jobs Act bill before the Special Assembly Committee on Climate Change. Vickerman leans forward to show the committee members a map of renewable energy installations. RENEW Wisconsin strongly supports the provisions in SB450/AB649 to expand the state’s Renewable Energy Standard to 25% by 2025, which includes a 10% in-state renewable energy set-aside. RENEW has evaluated the availability of specific resources to reach that standard and has concluded that meeting such a target is technically feasible. If adopted, the in-state set-aside will become the most powerful engine for job development and capital investment over the next 15 years. 1. The vast majority of the distributed renewable generating units installed in Wisconsin serve schools, dairy farms and other small businesses, churches and local governments. 2. Utilities are not in the business of installing these systems themselves. 3. In many cases the renewable energy installation went forward because there was a special buyback rate available to accelerate the recovery of the original investment made by the customer. Last week, I gave the example of the Dane County community anaerobic digester project that, once operational, will treat manure taken from several nearby dairy farms in the Waunakee area and produce two megawatts of electricity with it. The electricity will be purchased by Alliant Energy through a voluntary biogas tariff worth 9.3 cents/kWh. Unfortunately, Alliant’s biogas program is fully subscribed and is no longer available to other dairy farmers, food processing companies and wastewater treatment facilities served by Alliant. 4. Companies that install solar, wind and biogas energy systems are quintessentially small businesses, many of them family-owned. Renewable energy contractors and affiliated service providers constitute one of the few market sectors where young adults who have acquired the necessary skills to do the job well can find meaningful work at decent pay. 5. By its very nature, distributed renewable energy delivers nearly 100% of its economic punch to the local economy.